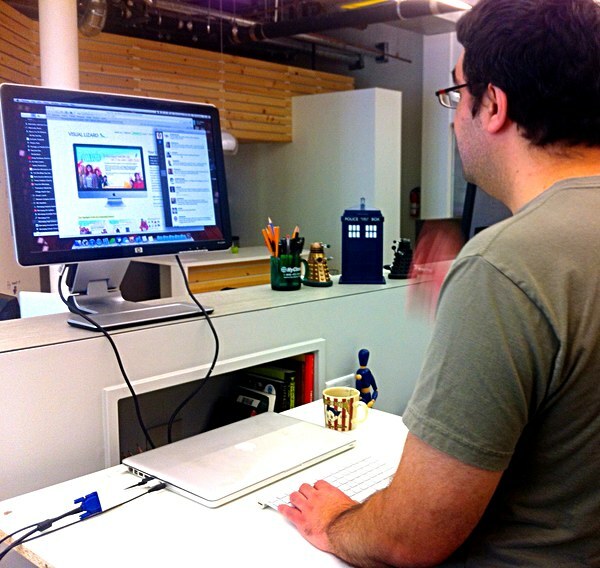 For the last half year or so, I've been working at a standing desk at Visual Lizard. It wasn't much of a construction job, consisting of just a couple stationery boxes and a spare plank of wood, but it did the job. Since August last year, I've adapted well, having no trouble standing all day to do my coding, writing, etc. I find myself more alert and more focused all day. The catch is I had adapted too well. I often had an issue working at home, a place I associated with rest and relaxation. Attempting to accomplish any task at my desk at home became more problematic after I got used to a standing desk at work because I started to equate sitting with "taking a break". So I decided to "build" a standing desk at home, too. I had a desk at home that I wasn't interested in completely replacing. Ignoring the cost in buying a whole desk, standing or otherwise, mine is triangular shaped, set in a corner of my room. I would have a hard time finding something to squeeze in that space, and my small studio apartment didn't have the floorspace to accommodate too much rearrangement. Instead, I took some online advice. I went to Ikea with the measurements of my home desk. I also had the measurements of my standing desk arrangement at work, so I knew what height was comfortable for me. Thanks to the provided paper tape measures at Ikea, I spent an hour measuring all the side table and coffee tables in the showroom until I found a low-cost solution. Twenty five dollars later, I had a wood coffee table the perfect height. I went for a wide rectangular coffee table to have room on the side for my mouse on the right, and any possible beverage on my left. I spent a buck or two buying some felt pad stickers for the bottom of the legs, so it doesn't scratch my desk surface.